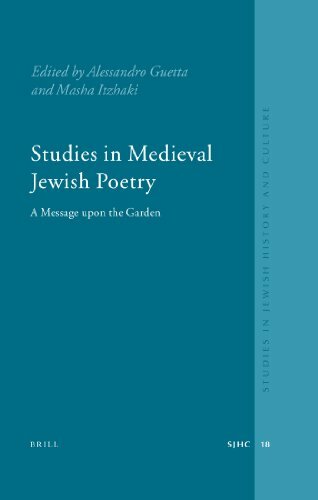 [PDF] Studies in Medieval Jewish Poetry: A Messager upon the Garden (Studies in Jewish History and Culture) | Free eBooks Download - EBOOKEE! Description: From Iraq to Spain, from Germany to Cataluna, from Italy to Yemen, poetry has been for centuries a privileged mode of expression in the Jewish world. Sometimes borrowing from the poetry of the land in which they lived, but always reinventing it in relationship to the Hebrew language and to the Jewish cultural references, the "medieval" Hebrew poets created an immense, variegated and fascinating corpus. In this book, some of the best specialist of the field analyse different themes and authors of this tradition, providing new insights to well-known authors or proposing less celebrated works as equally worthy of study. As a result of this scholarship, the English reader will be able to penetrate the different social and historical contexts of significant portions of Medieval Hebrew poetry as well as the cultural implications of technical choices apparently neutral. No comments for "[PDF] Studies in Medieval Jewish Poetry: A Messager upon the Garden (Studies in Jewish History and Culture)".